What happens when you combine alka-seltzer with water in a sealed film canister? The alka-seltzer with water will make carbon dioxide and make so much pressure that the cap will come off and shoot the film canister into the air. We believe that the canister with the least amount water will shoot the highest because there is more room for air pressure to build. Material 1: goggles so the film canister doesn't hit you in the eyes. Do not touch canister until after it has exploded. Be careful if you have a cut because the alka-seltzer will burn. 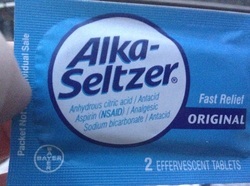 place two alka-seltzer tablets in the canister and put the cap on then quickly place on the table lid side down. BACK UP! Ceiling height, we think the gym would be a good place for us. In conclusion, as the Alka-Seltzer tablet fizzes,the carbon dioxide is released inside the canister. Pressure from the gas builds and eventually pops the lid off. When we used different amounts of water, we observed that the canister with the least amount of water had the highest flight. All in all when you mix Alka-Seltzer, air ,and water in a sealed canister pressure is created through carbon dioxide. I play football,lacrosse ,and baseball throughout the year I have read already 48 books this year. I also have to little brothers. I have one brother and one sister.I play baseball,football and a little basketball and I like to collect football cards. In my free time I like to ride my quad,jump on my trampoline,and hang out with my friends.My favorite subject is math. I play are football and basketball. my favorite subject in school is writing. in my spare time I play the drums and dirt biking. I have two brothers and one sister.